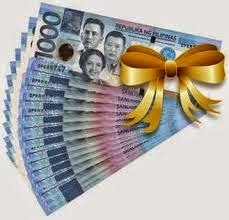 I know how it feels, excitedly anticipating the release of the 13th month pay. I've been there. When I was still a regular employee, as early as September, I am already thinking and planning how I will spend it (and in details, mind you). Who isn't, right? You have been working hard for a year and since this is a government-mandated payout to all employees, then who will not be so ecstatic, especially when the Christmas season is just around the corner? But before you start plummeting your mind on ways on how to spend it, why not rather be aware of the common pitfalls that a lot of employees do before you end up kaput, wherein your bonus was spent almost immediately before you can even savor it on Christmas day. Here are some of the usual boo-boos or mistakes for your awareness’ sake before you start roaming around looking for potential expenses ending up spending all your bonus’s worth. Well, let's prevent you from learning the hard way, why don't we? For some, 13th month pay means time to party! It’s the best time to raid the different bars in the Metro, to chill out in the coolest lounges, go through a series of eat-outs to awesome diners with your team mates and friends, and to party hard like there’s no tomorrow. All of a sudden, you became a mall-rat. Once you received your 13th month pay, you always find yourself frequenting the malls, bazaars and tiangges. Plus, you instantly turned to have all the patience in the world. The ending? Buying a lot of items that you don’t really need and regretting it afterwards. Giving and sharing your blessings is definitely a noble thing to do. But spending it all by buying gifts to your godchildren especially your loved ones who will forget or sometimes not use what you gave them after the holiday is a something to think about. Be creative and resourceful instead when it comes to giving gifts and showing how much you love them by cooking for them or giving those that you weren't able to use (try recycling, baby). Ever wonder why a lot of companies are always doing the year-end accounting reports? Just like them, it is about time to settle bills and other outstanding debts to at least have a clearer financial standing when the new year comes. Not doing so will just add-up interests and eventually you will start another year of financial burden. There’s nothing more frustrating than regretting those money spent in splurges and wanton expenses then realizing that there’s nothing left to set aside for savings. Like they say, you will never realize what you got until it is G-O-N-E.